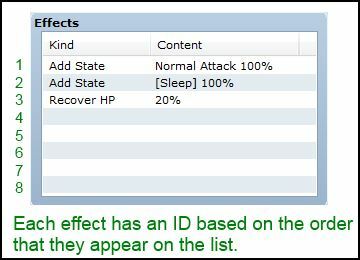 This script allows you to convert item/skill effects into “user effects”. By default, when your skill misses, none of the effects are executed. 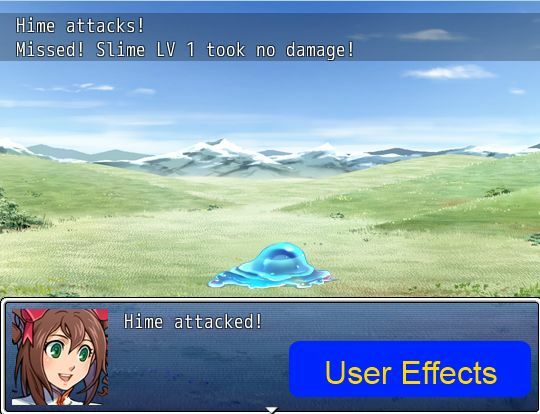 There are two types of user effects: “Pre User Effects” which occurs before the skill is executed, and “Post User Effects” which occurs after the skill is executed. Using this, you can specify that certain effects are supposed to be executed when the skill is used regardless whether it actually hit the target or not. The effects themselves are the same as usual; what changes is when they are executed. Where ID is the effect ID that you want to convert into a user effect. The first effect on the list has ID 1, the second effect has ID 2, and so on. If you are using custom effect scripts, note the order that they are added to the list. This should be explained in the documentation for those script. Suppose you have a skill with two effects: add state poison, recover HP. Now your skill will always recover HP even if it misses. These were originally called “user effects” rather than simply “use effects” so it may be grammatically incorrect. Yes the name is pretty terrible now that I think about it. So if I were to put add state normal attack 10% and mark it as a post effect would it hit the enemy for 10% of normal damage? or myself? It is the same as the default effects except you are guaranteed that they will run even if you miss. I do not understand. Why putting "2" will recover hp? You just count them from your effects list. The first one has ID 1 and so on.